Honor 7 will get a beta version of the update soon, followed by other Honor smartphones, while the final Android M firmware release should come out in February. Huawei Honor smartphones are very successful in some markets, and India is one of them. Huawei India has recently unveiled on Twitter that the company's Honor family will get the Android 6.0 Marshmallow update in February, but those anxious to get their hands on it earlier will also have the chance to try at least one or two beta builds before the final version comes out. Honor India's Twitter message does not say much - "Coming soon! Starting February 2016, we will be rolling out Android M to honor phones." - but the image that comes with it adds a bit of additional information as well. This image shows the devices that will get the Marshmallow treatment - Honor 4C, Honor 4X, Honor 6 Plus, Honor 6, as well as Honor 7. 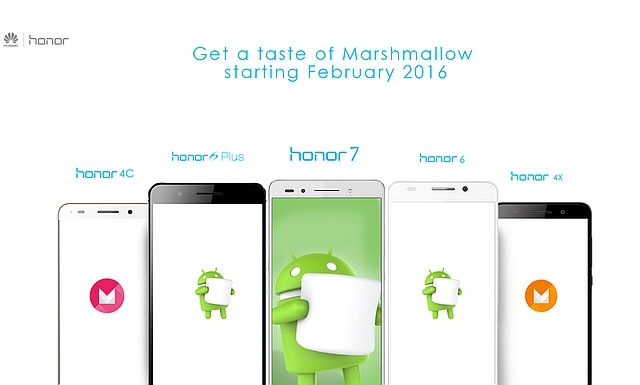 Details about the beta release of the Marshmallow update for the Honor lineup should come out later this month. The new Huawei Mate 8 is expected to show up on November 26th, but its launch has not been officially confirmed yet.